In this frank and inspiring memoir, Neven talks about his early life and his extraordinary success as an All Black rugby player and the challenges including a suicide attempt and his battle with alcoholism. But there is also hope, triumph and new beginnings with Neven going on to... read full description below. The inspirational memoir of an extraordinary All Black, with a forward by Keith Quinn New Zealand rugby union player Neven MacEwan played 52 matches for the All Blacks from 1956 to 1962, including 20 internationals and two South African provincial matches as captain. 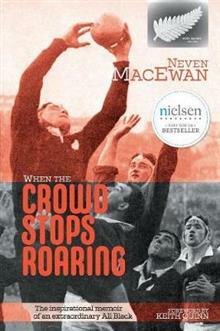 In this frank and inspiring memoir, Neven talks about his early life, and his extraordinary success as a rugby player. A lock and number eight, Neven represented Wellington at a provincial level, before achieving the ultimate in New Zealand rugby-wearing the revered All Black jersey. His contemporaries included Tiny White, Don Clarke, Wilson Whineray, Kelvin Tremain, Colin Meads and Ian Clarke. But this is not just a memoir of rugby achievements; Neven talks frankly about the difficulties in his life 'when the crowd stops roaring' and the reality away from the rugby field. There are immense challenges, including being charged by New Zealand Police for theft, a suicide attempt, and his battle with alcoholism. But there is also hope, triumph and new beginnings in this candid memoir, with Neven going on to give back and help numerous others who have lost their way. All Black, school teacher, shipping travel agent, public relations officer, prison chaplain, husband, father and grandfather, When the Crowd Stops Roaring is an insightful biography of an extraordinary New Zealander, both on and off the rugby playing field.